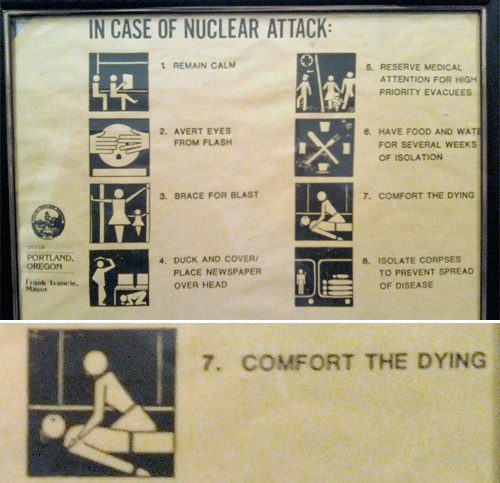 In Case Of Nuclear Attack: #7 – Comfort The Dying | OhGizmo! I’m kind of glad I only caught the tail end of that Cold War, because living with public service announcements like this on the wall would be kind of a downer. This is priceless!!!!! I have to download the picture. Ha2. At first glance I misunderstood it. “Place newspaper over head” is also great advice. No better radiation shield than 20 layers of newsprint. Apparently my school though our desks would suffice in stopping a nuclear bomb. I can still remember the drills. That's funny, men are always dieing first. Is this poster for real or a gag? Anyone? I totally thought that woman was straddling the apparently dying dude. That would make her comfort a lot more Warren Ellis in nature than they probably intended. Just an fyi, this is from around 1981… But still funny.